At first sight this picture is attractive but nothing out of the ordinary. It depicts an Austin Seven 65, a model made in the UK from 1933 to 1934. It is left-hand-drive, so perhaps it was made by Dixi – but they stopped production of Austin 7s in 1931. No: this car was in fact made by Willys Overland Crossley in their Berlin-Adlershof factory. We have already talked in Snapshot 178 about the history of the Willys Overland Crossley company from 1919 to 1934 – and its Berlin factory that made Overland Whippet models from 1928 until its closure in 1930. But that was not the end of the Berlin story. In 1932, the Austin Motor Company made a gentleman’s agreement with Willys Overland Crossley to assemble and market left-hand-drive Austins in Germany. The models produced included RL and RP Saloons as well as several Sports models: 65, Nippy and possibly Speedy. Herbert Austin agreed to finance advertising of these German-made cars, and a number of motor racing events in Germany, as part of a 2% commission based on the German retail price of the Austin. Willys Overland Crossley provided very little of its own content, apart from manufacturing and assembling some left-hand-drive components. There is no reliable information as to how long the Berlin factory continued to build these Austins, but there is some recent evidence from left-hand-drive Austins with Willys Overland Crossley nameplates that production, at least of left-hand-drive components if not of complete cars, continued as late as 1938. 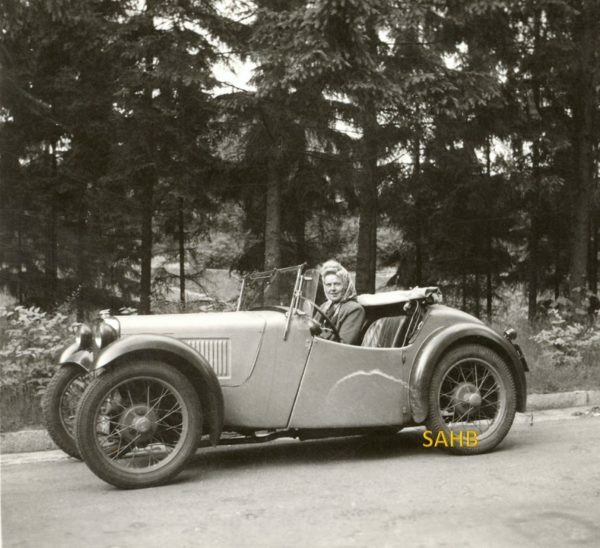 Production numbers are difficult to find, but Klaus Gebhardt’s book on the Austin Sevens made in Adlershof suggests that only 700 of these cars were made at the factory between 1932 and the end of production. Our thanks are due to SAHB member Thomas Ulrich, himself from Berlin, for this delightful picture. Thomas tells us that the car was snapped in Johannisthal, a district of Berlin right next to the Adlershof factory. He also gives us a production figure of 602 of all models. And one final snippet of information: we know that this is a 65 with aluminium body and steel wings, and not the later all-steel-bodied Nippy, because of the absence of wing-mounted sidelights.